Chefs, home cooks, and anyone involved in cooking were aghast when they found out just how dangerous Teflon is to the health. Believe me, I was just as horrified. The reality behind Teflon being overly unhealthy is controversial because of the mere fact that smelling the fumes of an overheated Teflon pan can cause noticeable effects like dizziness and lightheadedness raised major concerns. This resulted to most cookware manufacturing companies phasing out such a dangerous substance and looked for alternatives in making non-stick cookware. One of my favorite cookware brands happens to produce non-stick cookware pans that are known to be the safest in the market – the Circulon cookware. And for that reason, I wrote a number of Circulon cookware reviews that you will find handy, especially in picking out the perfect set of non-stick pots and pans for your needs. How and When Is It Dangerous to the Health? How Much PFOA Are We Ingesting in Our Body? How Can We Reduce the Risk of Exposure? What is the Circulon Cookware Non-stick Coating Made of? Is It Safe to Use Non-Stick pots and pans? But before we start talking about Circulon Cookware, let’s delve deeper into Teflon and substances used to make pots and pans non-stick. Teflon, chemically known as polytetrafluoroethylene (PTFE), is a substance that is created from a mixture of perfluorochemicals or PFCs. In 1938, the DuPont chemical company made a breakthrough in creating the most non-polar substance. PFCs or Teflon, in particular, is extremely resistant to most chemicals making it a major component in creating and manufacturing cookware, paint, non-stain fabrics, and many more. PFCs are substances that are great chemical repellents because they are actually recycled chemicals which are by-products of other chemical reactions (this we don’t really need to discuss). They prevent food from sticking to cookware, they make fabrics highly resistant to stains, prevent baby poop from leaking out of the diapers, and prevent any substance or chemical from practically sticking to plastic. PFCs are known to be very persistent making materials made of this material very hard to degrade naturally in the environment. Research has shown that Teflon has a dangerous chemical called PFOA, or perfluorooctanoic acid. It is a man-made chemical that poses a dangerous threat to our bodies. PFOA is generally an unsafe material in its liquid form but in its solid state, it is inert and is less likely to stick to our food. The PFOA in Teflon returns to its liquid form when it reaches a temperature higher than 350ºC (662ºF). However, dangerous fumes of the PFOA will be released when your pan (or pot) reaches temperatures higher than 500ºF. It is best to avoid having your pots and pans reaching these high temperatures. When we inhale these dangerous fumes, we get the Teflon flu or the polymer fume fever. There is no known cure for it but only to wait for the body to flush the fumes out for you to get back to normal. There is no recorded research regarding the amount of PFOA we are consuming but factual data shows that our bodies are only consuming tiny amounts (if any). However, since PFOA is not biodegradable, it stays in our body for a really long time and a buildup of small amounts of this chemical in our body can result in a cancerous tumor. Due to the growing concern over the long-term effects of PFOA in our bodies, most cooking manufacturers have decided to outlaw the chemical in making non-stick pans. One of these companies is the maker of Circulon Cookware. Since 2015, the makers of Teflon, DuPont, has been finding a safer alternative for non-stick coating. They were able to produce a non-stick coating called, ‘Autograph’. It is a three-layered coating that is 100% free of PFOA. It is applied throughout the interior and exterior lining of the Circulon pots and pans. Although it does not have the same resistance as Teflon, Autograph has great non-stick abilities but and is also known to be more degradable; thus, requiring lower cooking temperatures. That’s why Autograph has a tri-layer coating: to have better resilience. On the other hand, Autograph is stronger and has a longer lifespan than Teflon. Manufacturers removed PFOA as a chemical being used in making non-stick pans in 2006 so the latest non-stick pots and pans are made without this dangerous substance. To learn more about Teflon and PFOA. Safer non-stick pans are now growing in demand and with safer health measures. Circulon Cookware is known as one of the best and safest non-PFOA cookware brands available. They have tons of various non-stick pan lines to choose from, you’ll wonder which one is the best. One of the leading companies creating safe non-stick cookware set is Circulon and for that reason, I’ve trusted this brand for quite a while now. The only dilemma for me now is to decide which of the specially crafted cooking sets I should get. Let’s find out! Welcoming a new style of non-stick cookware, you should know what to look for. The Circulon line is manufactured by Meyer and they specialize in manufacturing non-stick pots and pans. 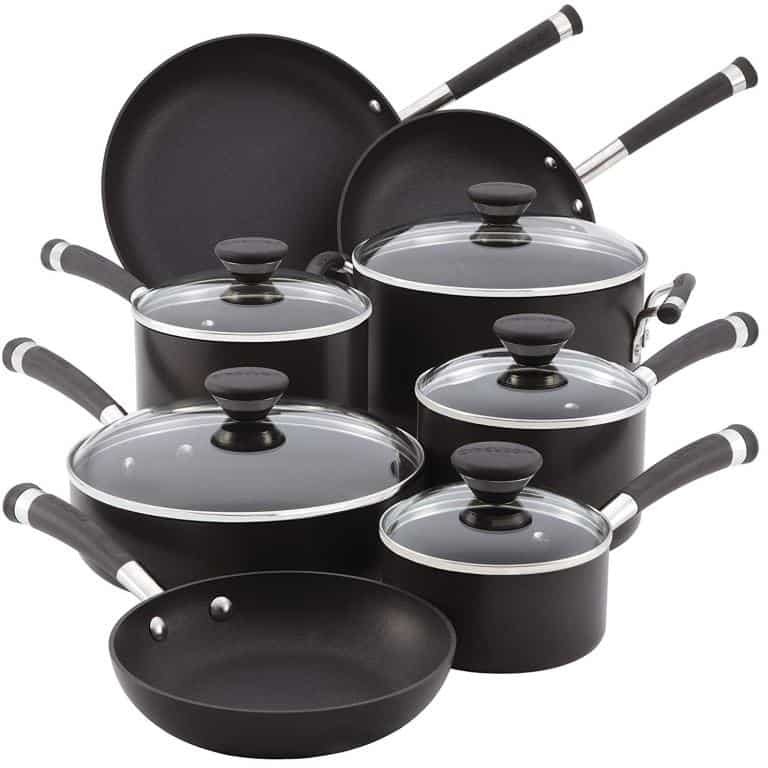 Most of their non-stick cookware sets fall in the midrange cost bracket which makes them ideal home kitchen sets. I’ve listed a few of the top of the line cookware sets that Circulon is very proud of and certainly some of which I have tried myself. Known as the most durable Circulon line, it is the type of cookware set that allows you to cook anytime, anywhere, and no matter how long. All the lids are made of tempered glass. The pots and pans are made of hard-anodized aluminum making them less susceptible to rust and corrosion. The pots and pans are also tempered which is great for heavy duty cooking. No matter how much you love to cook with them, won’t wear out easily. All, except for the frying pan, are flat bottomed which allows you to cook your food evenly. In addition, the pans have raised circular grooves on the base of the pan that reduces surface abrasions on your food. The circular grooves also help prevent the food from sticking to the bottom of the pan even when they get burnt. The hard-anodized aluminum is built for strength. The pots and pans are hardened to withstand long hours of cooking so, making a pot of stew or making slow-cooked meals will not be a problem. The hard-lined aluminum anodized pots and pans are made to withstand warping even when you cook food on an open fire when used on a campfire or cooking using red hot coals. Though the Acclaim series is created for heavy duty cooking, it has a maximum cooking temperature of 400ºF. The Acclaim has a triple-layer of non-stick coating over a thick hard anodized aluminum to maximize heavy duty use. It is not dishwasher safe though. You will adore the handle of the Acclaim line. The handles on the glass lids are pretty and adorable. The round triable knobs are made of a stainless steel base with a rubberized grip. The handles are made of stainless steel with a rubberized super grip for easy handling and comfort. They are also longer to give you more room to hold. The thick rubber grip doesn’t get slippery and doesn’t get hot as well. The handles also have fold-in rings at the tip so you can easily hang and store your pots and pans. The Circulon Acclaim is a great set that is perfect for a family that loves cooking both indoors and outdoors. Frequent cooking especially slow-cooked meals would be easy with the Acclaim cookware. For any cooking needs on the stove, in the oven or out on open fire, this is a great cooking set for you. If you are looking for a kitchen set that will help you upgrade your baking cooking set, you don’t need to look for anything else. This set has got you covered. This set is wonderful when it comes to making sweets, baking and the like. To ensure the best cookware in making sweet treats, you have hard anodized aluminum with multiple layers of non-stick coating. The non-stick coating durable enough for you to melt chocolate, caramelized sugar, and even bake without an oven. Unlike the Acclaim, the aluminum pots and pans are a little lighter and thinner. Contempo is designed for lighter yet frequent use. It can withstand frequent cooking and baking needs (especially the Dutch oven). The pots and pans are flat-bottomed with straight sides for even and steady cooking. Cooking with this set is easy since it heats up fast but also cools down quickly. This is great for making bread, cooking pasta, and more. The pots and pans are also lightweight which makes it very easy to handle when cooking. Since it isn’t heavy, you can use the pans in a one-handed operation. You can easily use the pan with one hand which allows you to multitask while cooking. Like the Acclaim, it has a 400ºF maximum temperature. Going beyond may result to the non-stick coating forming air bubbles around the surface of the pan or pot butut because the pans are lighter, the handles are the ones adding weight to the cookware set. It is not a flaw for other cooks since it helps in balancing the cookware pieces. The pots and pans are sturdy enough to handle metal utensils making it an ideal set for multiple purpose usage. Aside from the mentioned extended handles of the pots and pans, the handles of the tempered glass lids have extra height giving way for various hand sizes to have a comfortable hold on the lids. They are also contoured to fit perfectly in one’s grip. The Contempo Complementary cookware set is a great addition to any existing cookware set. With numerous new types of cooking, we need not settle for an oven to actually bake or roast in it. It is the perfect companion to any baker’s cooking set. 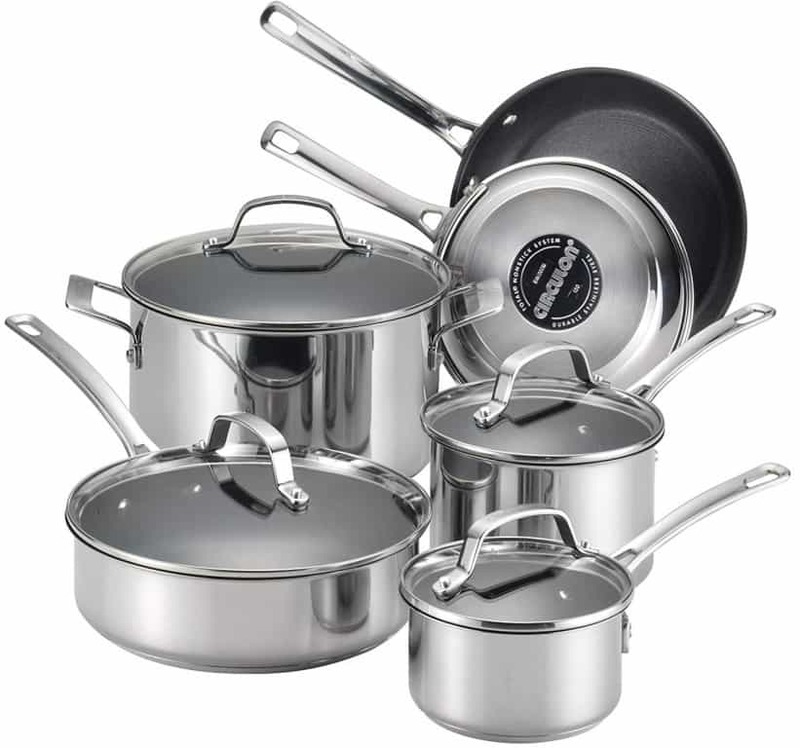 Every cookware line comes with a deluxe line serving only the toughest and most demanding kitchens, a chef’s kitchen. The Premier Professional Cookware set is Circulon’s top of the line series marked as the only cookware set with a dazzling hue of chocolate bronze. The set has a stunning bronze color for a modern yet classy look that is not just fit for cooking but perfect for decoration as well. The Premier Professional is made of hard anodized aluminum and features the signature Total non-stick system at the base of each pot or pan. It offers superb heat retention and quick heating features, is more lightweight and twice as durable. The material has an extra layer of coating for the chocolate bronze hue to provide your kitchen an interior decoration boost. The set itself is very versatile and it can even handle metal-tipped utensils. Cooking any type of food in the Premier Professional is a breeze. This set is designed by Circulon to have better overall heat retention. In addition, the set easily heats up but does not quickly cool down and is highly compatible with all types of cooking options from stovetop gas range to induction and open fire. The cookware offers maximum performance with its flat bottom and smooth straight side. The cooking set is oven safe up to 350ºF but can go as high as 400ºF as its maximum on an open fire. However, even the handles get hot despite the hand grip. You will adore that the cookware set has amazing features like the rolled out rim and a lip for some of the pots. This allows you to pour out liquid or food from the pan or pot with ease and minus the mess. The saucepan lids also come with a built-in strainer to separate the liquid from the solid making it ideal for cooking pasta, making broth, and even simply cooking stock. The handles are also a great design feature since the handles on the lids are high-rised allowing more knuckle room for bigger hands to have better hold of the lids. The pan and pot handles are also extended in length for better grip. The handles are made of a thick stainless steel base and silicone wrapping for non-slip handling. They also come with holes at the end of the handles so that you can hang them up for easy storage. This is by far the lovechild between a professional cookware and a home cook’s perfect kitchen set. With versatile cooking methods and efficient ergonomic design features, it is hard to find any other cookware set that can surpass the capabilities of the Premier Professional cookware set. Styled to perfection, this cookware set brings the perfect combination of stainless steel cookware with a non-stick surface. 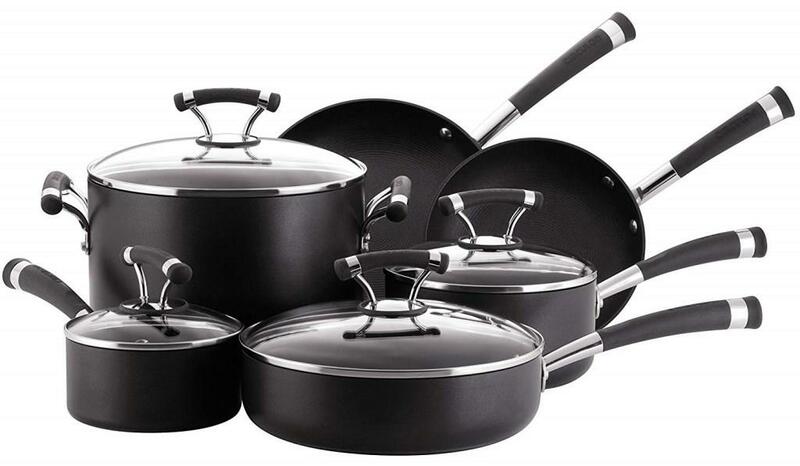 Known as the affordable line of Circulon, this is also labeled as the best overall cost for value cookware set. This is a line of Circulon cookware is made with a stainless steel base and cool triple-layer Autograph non-stick coating. The pots and pans are impact bonded aluminum bases with a layer of aluminum and finished with a non-stick coating. The cladding allows your cookware set to have a triple threat action with even heating and prevention of hot spots, quick heat up and great heat retention, and finally, controlling cooking temperature. The pans are very very easy to cook with and what makes it unique is the great temperature control that it offers. With the multiple layers of cladding, various metals gives you a better mode of cooking. You can also cook with this cookware set anywhere even on an induction top. The pots and pans are very light with quick heating properties making it a great kitchen companion in cooking various recipes. And because it has amazing heat retention and temperature control delicate foods like crustaceans and recipes with dairy products in them cook well in these pots and pans. Since this is a cladded cookware, most of the pots and pans are heavy. The full metal body adds to the weight of the cookware. The highest temperature these pans can handle can reach an oven temperature of up to 500ºF. The pots and pans look stunning with smooth full stainless steel base and sides but carries the wonderful Total food release system. The set is more resistant to warping and corrosion provided that it is not exposed to extreme pressure. With the heavier state of the pots and pans, the handles are designed to be thinner with an inward groove for your fingers to have a better grip on the bare handles that have double rivets for a stronger hold on the pots and pans. For durability and great temperature control, you will be surprised to know how affordable it is. It is a cookware that is great to handle and to cook in. Here is a simpler way of understanding the different cookware sets we have in our list. Circulon Cookware is mid range cookware that specializes in making PFOA-free nonstick pans and with the tons of cookware set lines they have, it is only fitting that I pick out the one with the best qualities. On a personal note, I love the Circulon Premier Professional Cookware line because it offers the best of both worlds. Though it is a little bit more expensive than other lines, the Premier Professional is an amazing cookware that is versatile and reliable. On the other hand, I would also recommend The Circulon Genesis Stainless Steel line since it is very easy to control and cook in plus the fact that it is very affordable. This is the choice that many buyers with a smaller budget can purchase while enjoying premium quality cookware. These Circulon Cookware Reviews are subject to my personal preference in cooking and your opinion may vary from mine, however, I’ve witnessed with my own eyes the benefits of using these amazing cookware making them some of the best I’ve ever used.